Titus, a lovable 100 pound Golden Shepherd Mix is quite at home on his Harrison Sofa. Among our largest styles, the Harrison offers durable, pebble-grain faux-leather with high quality, furniture grade construction. 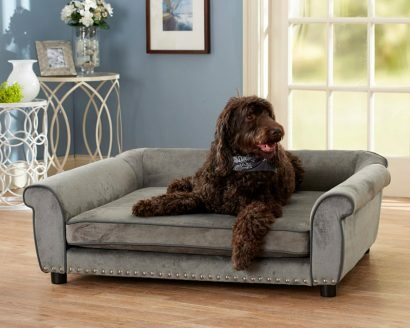 Its classic look with rolled arms and tufted back make this a favorite with the grandest sized dogs. It is easy to wipe clean with a damp cloth. Suitable for large pets up to 100 pounds. This is Summer, a 75 pound Boxer, comfortably lounging on one of our largest style sofas, the Jackson. Measuring 4 feet across, it is fully upholstered in smooth velvet with nailhead accents. 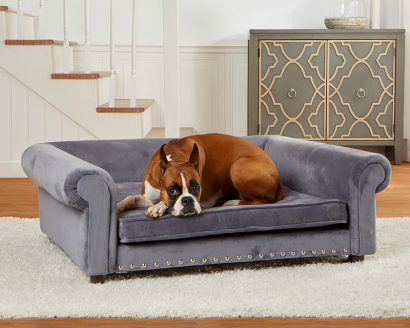 The Jackson Sofa is made with durable and sturdy wood frame construction and boasts a high loft, memory foam cushion, so our large sized pets are offered some relief to aging and aching joints. Cooper, a 44 pound Golden Doodle sits proudly on the Outlaw Sofa, which lives up to its name, being the biggest pet sofa in all the land! 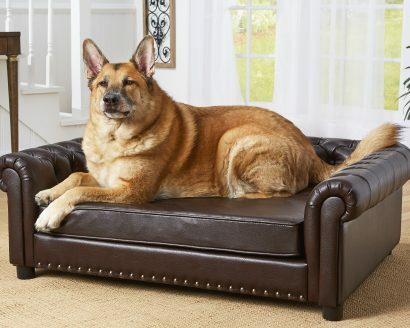 It’s perfect for the largest of dogs to lounge in total comfort. It is fully upholstered in Ultra-Plush and pebble-grain, faux-leather trim with brass nailheads. The Outlaw is made with durable wood-frame construction, low profile arms and a high loft, milled, memory foam cushion, so our grandest sized pets are offered some relief to aging and aching joints. Meet Jax, a 48 pound Labradoodle hanging out on the Outlaw Sofa, which is among the very largest of our pet sofas. It’s perfect for the biggest pet who needs space to sprawl. It is fully upholstered with a durable wood frame for maximum strength and a memory foam cushion to offer relief to aging and aching joints. 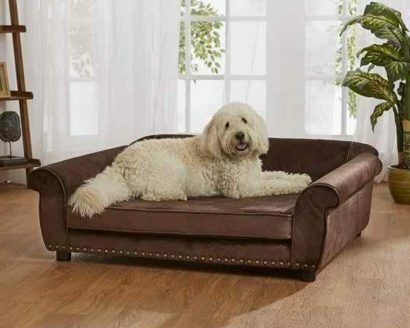 This 4 foot long sofa easily accommodates pets up to 100 pounds.